This security poster illustrates the TMD-B Russian Wooden Anti-Tank Mine. This anti-tank mine is a wooden mine dating back to WW2, but because of the simple method of construction, the mines can easily be locally made. The mine uses a single pressure operated fuze. The factory mine fitted with 2 x 200gm demolition charges, but can be utilised with other available explosives. 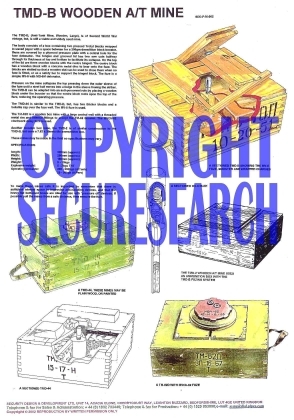 This security poster features the TMD-B wooden anti-tank mine’s technical specifications, a sectioned TMD-B showing the MV-5 fuze, booster and wrapped charges, and a sectioned MV-6 fuze. The security poster also shows a TMD-62D with MVCh-62 fuze, a sectioned TMD-44, a TMD-44, and how the TMD-2 wooden anti-tank mine uses an ammunition box with the TMD-B fuzing systems. A sectioned TMD-B showing the MV-5 fuze, booster and wrapped charges. The TMD-2 wooden anti-tank mine uses an ammunition box with the TMD-B fuzing systems. A TMD-62D with MVCh-62 fuze. The TMD-B wooden anti-tank mine’s technical specifications. This security poster features the mine's technical specifications, a sectioned TMD-B showing the MV-5 fuze, booster and wrapped charges, a sectioned MV-6 fuze, a TMD-62D with MVCh-62 fuze, a sectioned TMD-44, and a TMD-44.